Two centuries ago, the founding fathers arrived in Philadelphia to create a Constitution that would give life to two radical ideas: that ordinary men and women had the capacity for self-governance, and that government derived its power from the people, not the other way around. As choices were being debated vigorously, Benjamin Franklin noticed a painting of the sun on the back of George Washington's chair. He wondered: Did the painting represent a rising or a setting sun? When the debate was done and the last of the delegates had signed the Constitution of the United States of America, Franklin said to those sitting by him that he now knew what kind of sun it was that was painted on that chair: It was a rising sun. 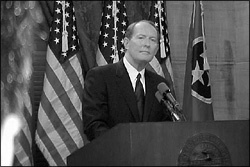 That rising sun was hard to see when I became Governor of Tennessee. I was sworn in three days early in the Supreme Court chamber across the street because my predecessor had been selling pardons to convicted criminals, and I was going to put an immediate stop to it. I can still see our son Drew, then only nine, peering straight ahead, his nose barely above the Bible on which my hand rested. Daughters Leslee and Kathryn were on tiptoe, trying to imitate me by trying to place their hands on the Bible, too. Honey was four months pregnant with Will. Everyone was silent. They knew things weren't right. There were tough choices to be made. First, I secured the Capitol. Then we turned the previous governor's records over to the FBI, locked the prison gates, and I asked Fred Thompson, now one of our U.S. Senators, to review all the pardons that had been granted. I wanted to bring out the best in our state. But we had a long way to go. Our people were discouraged and mistrustful of government--and for good reasons. I was taking the reigns of state that was the third poorest in the nation. A third of our Eighth Graders couldn't read and write at their grade level. Our roads were poor. We were not making one automobile. The Information Age was coming and we weren't ready. It looked dark that day I was inaugurated, but I am an optimist. I know that sometimes night is darkest before the dawn. And I knew that, for Tennessee, it was time for the sun to rise, not set. The choices we made then changed our lives. When I took office, there weren't many Tennesseans who thought we could attract the Nissan plant. Or the Saturn plant--and become the nation's fourth largest car-producing state. Or be the first to pay teachers more for teaching well. Or build 100 miles of Interstate highway with our own money so we could create new plant sites. Or become the fastest-growing state in family incomes. But, working together, we did all of that and we did it with one of the lowest state tax rates in the country. Just as Benjamin Franklin saw a new nation in the light of that painted rising sun, and I saw my own state ready for the dawning of a new day, I now see a nation at the end of The American Century, illuminated by the early light of a new century. This is another time of great choices; of decisions that will affect our lives for years to come. I see a country that has done great things, but capable of striving to be even greater; a nation that is never finished, but is always beginning anew, limited only by the limits of our imagination. Will we keep our prosperity? Will we live in safety from terrorists? Will our children be ready to lead? Will there be a second American Century? Nearly Forty years ago, President Kennedy challenged America to achieve what seemed impossible at the time: to land men on the moon and return them to earth. He said, "We choose to do these things, not because they are easy, but because they are hard." Just seven years later, our nation had done the impossible. I am here this morning to declare that I will be a candidate for President of the United States because I am ready to help our country face the challenges of a new century--and make the right choices. This election will be about restoring respect for the presidency. It will be about the character of the nation and its institutions. Above all, this election will be about raising our standards and bringing out the best in America--because that is what it will take to have a new American Century. In 1980, Ronald Reagan asked the American people, "Are you better off now than you were four years ago?" Most people answered "no." Today, my question is, "Will our COUNTRY be better off four years FROM NOW than it is today?" I want the answer to be "yes," but it won't be if we continue in the direction the "Wizard" Clinton and his faithful servant Gore are taking us. They have given us what their polls tell them--but that is not leadership....And, while it is true the peace and prosperity they inherited is still with us, what of the future? Look behind the screen of their magic show and see what has happened in the years since they took over: Twelve more countries have jumped over us in high school graduation rates; taxes are higher; the federal regulation book is thicker; our national defense is weaker. It is harder than ever for parents raising children. Seven tons of illegal drugs come across our borders every day. Dictators thumb their noses at us; we are more divided than ever by race; and our standards of right and wrong have all but disappeared. Those are not the building blocks of a new American Century. That is not America at its best. If we are going to bring out the best in America, we will need a president who talks straight--and who listens. A new American Century will require a moral foundation laid by a President who respects both the office and the people who put him there; a president who knows what it took to make this nation great and what it will take to keep it that way. I believe that the cynicism and rancor that swirl about our public institutions today do not represent a permanent affliction. Rather, they are a temporary condition that can be washed away by a leader who is willing and able to unite our people rather than divide them. Presidents, after all, are in a unique position to appeal to our "better angels." That is a responsibility I am prepared to accept and ready to use. Some people say I've been working awfully hard to prepare for the job of President. I assure you, if I could find an easier way, I'd do it. But, among Republicans in modern times, only General Eisenhower made it the first time he tried. This time the race is wide open. There is no one whose "turn" it is. It will take strong and practical proposals to bring out the best in America. To Strengthen our national defense. By fixing public education, I mean this: Send the Washington bureaucrats home, and send their money to the states, the classrooms and especially to parents--in the form of HOPE scholarships for the children. Let parents decide which school is best for their children. College-age students with scholarships can choose their college or university. If a federal HOPE scholarship is good enough for an 18-year-old, it is good enough for a six-year-old. Ninety percent of what a child needs to succeed in this world he or she learns best in a strong family and a good school. That is why I will be a President on the side of parents raising children. I have visited schools in virtually every state in the nation. I know that teachers and principals are suffocating under court orders, union rules and government regulations. They need more freedom, not more regulation. And, it is time to give every public school the same freedom from regulations that charter schools have. And, it is time schools reported to their communities and the parents, not to Washington, D.C.
As President, I would lead a movement state by state to transform our public schools. To pay good teachers more. To end teacher tenure so no child is made to be in a classroom with an incompetent teacher. Our schools can be the best in the world. What is missing is the political will to put practical reforms in place. As President, I would intend to supply that will. By insuring economic opportunity for all Americans, I mean this: You keep more of what you earn and government gets less of it. It means that Social Security will be there for those who depend upon it and those who expect to. But it also means more options for younger workers to manage more of their own retirement savings. It does not mean letting the likes of Mr. Clinton and Mr. Gore and their cronies invest our retirement funds for us. By improving family incomes I mean this: End death taxes, the capital gains tax and the marriage penalty. It means going back to the two Reagan tax rates of 28 and 15 percent. It means cutting federal regulations exactly in half. It means getting government on the side of parents raising children by tripling the tax deduction for each child, to $8000--making it worth what it used to be worth. And, it means making sure the tax code doesn't discriminate against parents who choose to stay home with their children. When I think about strengthening our national defense, I think also about the young airman I met not long ago who said to me, "Governor, I am prepared to give my life for my country. How have you prepared yourself to give the order?" My answer was this: I have learned to be as committed to you as you are committed to our nation. There is no greater responsibility for an American president than his or her role as commander-in-chief of our armed forces. The threats of the Cold War have been replaced by new threats from rogue states, terrorists and power-mad dictators. The hardest decision a president will ever make is whether to send American fighting men and women into harm's way. If I am forced to make such a decision one day, our armed forces can be confident they will be the best-equipped, best-trained fighting force in the world. And, before I sent American troops abroad, I would make sure we had not only an "exit" strategy, but a "success" strategy." By strengthening our national defense, I mean building a strategic missile defense system to defend the city where you live--and defending our troops in the field--from attacks by rogue states or terrorists. By strengthening our defenses I also mean defending ourselves against the drugs that come across our borders. I would propose to Congress that we create a new branch of the armed services to stop the flow of those drugs. The most important choice we make for the new century may well be this one: Will we be a nation of individuals or a collection of special interest groups, each shouting, "My turn"? America is at its best when we pull together. In the Sixties, not two miles from this Capitol, as a student editor, I helped desegregate Vanderbilt University. In the Eighties, as Governor, I appointed the first African American supreme court justice and, as president of the University of Tennessee, appointed its first African American vice presidents. In the Nineties, as U.S. Secretary of Education, I said "no" to scholarships based solely on race. I made these decisions for this reason: Citizens of a nation who pull together should never label one another based on race. That means government's helping hand--affirmative action--is for everyone; always based on need, never on race. This nation is like no other on earth. All of us--or our ancestors--came from somewhere else. The backgrounds we represent are bound together by a simple but powerful idea: our love of freedom. Yes, let us celebrate our heritage, whatever its origin, for we are proud to be a nation of immigrants. But for each of us the greatest source of pride should be these four words, "I am an American." Today marks the beginning of a campaign that leads to the caucuses and primaries. The first will be in Iowa, 48 weeks from now. I am pleased and honored to have as my national campaign chairman Terry Branstad, who recently concluded 16 years as Governor of Iowa. And the support of Governor Don Sundquist of Tennessee and Governor Mike Huckabee of Arkansas. I thank them, and all of you, for being with me this morning, and I especially thank Honey and our family for their love and support. This week I will take my message to Washington, D.C., New York, New Hampshire, Iowa and California. Over the following two weeks, I will outline in detail the policy goals I have outlined here briefly, as well as other issues. In Summer 1994, I drove across America. Approaching Mount Rushmore, in South Dakota's Black Hills, I thought of what my grandfather used to tell me: "Aim for the top. There's more room there." First you see George Washington, 60 feet high, imagining--it seemed to me--that there could BE a country such as ours. Then Jefferson, imagining what that country could BECOME. Then Lincoln, imagining that it was worth SAVING. Then Teddy Roosevelt, imagining that we could DO anything we set our minds to. That memorial was conceived on a truly grand scale, when America was confident and dreamt big dreams. Those four presidents brought out the best in this nation to make those dreams realities. We must dream bigger and bolder dreams if ours is still to be a great nation in the 21st Century. I have seen what can happen when we set our standards high. I have seen it in Tennessee and I have seen it in all of America. We have been led to the end of this century by the finest generation since our nation's founding. If we face our choices as they faced theirs, we can create a second great American Century. If they could reach the moon, we can reach into each other's hearts, put aside racial and ethnic labels, and pull together. I believe in the United States of America and its political and spiritual heritage. I know that, working together, we can make sure that it is a bright sun that rises on America's new century. I invite you to join me in a campaign to expand American freedom, renew its pioneer spirit and bring out the best in America. Let us begin right here, right now.